Legal Marijuana | Is it Dangerous to Drive in Colorado? Is it Dangerous to Drive in Colorado? Many proponents of marijuana legalization held the belief that legalizing marijuana would cause a percentage of drinkers to choose cannabis over a Cabaret or cocktails. Opponents of the legalization of recreational marijuana proclaimed Colorado’s roads would be more dangerous because there would be more fatalities and injuries from additional stoned drivers. Except for a couple reductions in alcohol-related fatalities at the height of new marijuana legalization, things pretty much stayed the same. Alcohol-related fatalities are in the same ballpark, and non-alcohol related fatalities did see an increase in 2012, 2013 and 2014, albeit a statistically insignificant one from 2013 to 2014. So did drinking drivers switch to pot then go back to drinking? You’ll have to ask the drivers to know for sure, but you can be assured law enforcement agencies, politicians, and policy makers want to find out. There were expected upticks in fatalities, but were these fatalities from cannabis consumers? 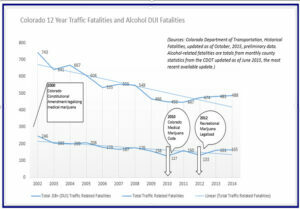 Figure 3: Chart from CDOT at Colorado.gov displaying trends in Colorado Fatal Crashes and vehicle miles traveled. The population of Colorado increased, and there were more vehicles on the road. The chart (Figure 3) from the Colorado Department of Transportation, available at Colorado.gov, shows that fatal accidents can be reduced, even as vehicle miles traveled increases, but the slight uptick in vehicle miles traveled from 2012 to 2013 is congruent to the slight uptick in fatalities for that year. It’s important to recognize that from 2012 to 2013, the number of people that died in traffic accidents increased, but the number of traffic accidents actually decreased from 2012 to 2013. 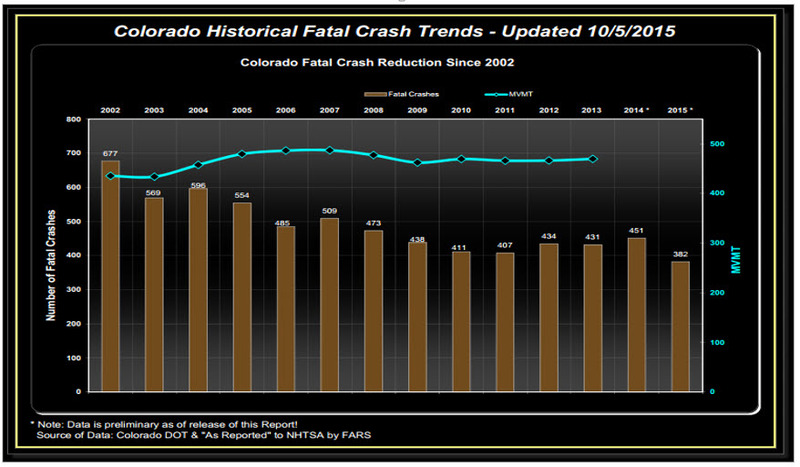 Investigations by Colorado State Troopers show that from 2011 to 2014, fatal injuries and crashes have decreased. In 2011 DUIs and DUIDs were responsible for 16% of state trooper investigated accidents, in 2014 they were only responsible for 13.8%. In 2012, recreational marijuana was legal, but the bill wasn’t signed by Governor Hickenlooper until December of 2012, so 2013 would have presumably been the celebratory year for novice cannabis users and drivers. But, fatal crashes and DUI/DUID related crashes and injuries decreased from 2012 to 2013. This is shown in the accident investigation tallies shared in the 2015 Annual Report from the Colorado State Patrol (Figure 4). Figure 4: Source: Colorado State Patrol Annual Report, 2014. Indicates trooper-investigated DUI and DUID fatal and injury crashes saw a decrease from 2011 to 2014. Those years had a new medical marijuana laws in place, the legalization of recreational marijuana and the first year of legal retail marijuana sales in Colorado. DUI laws apply to driving under the influence of marijuana, as well as alcohol and other drugs. It would be safe to theorize that a DUI recipient who has illegal drugs in their system as well as legal marijuana would have gotten a DUI with or without legalized marijuana. Legalization wasn’t a decision-making factor for those drivers. But a driver who drives under the influence of alcohol, may likely drive under the influence of legal marijuana, but not necessarily illegal marijuana. But if pot and alcohol are in the system, it’s likely these people would have gotten a DUI with or without the pot. Court DUI and DWAI filings include alcohol, pot, and other drug-related driving under the influence and driving while ability impaired. Did DUIs Increase in Colorado After Marijuana Became Legal? Figure 5: Data from the Colorado Courts Judicial Branch Annual Statistical Report Fiscal Year 2015. Shows DUI and DWAI filings continued to decrease, despite legalizing recreational marijuana. 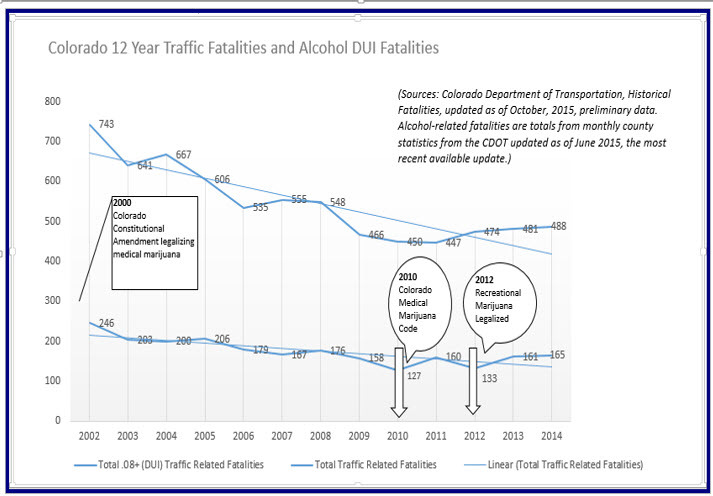 Overall, Colorado DUI and DWAI court filings continued to decrease, even after recreational marijuana was signed into law December 10, 2012. Figure 6: This chart is from the Annual Statistical Report for Fiscal Year 2015 from the Colorado Courts Judicial Branch. Overall, DUI and DWAI filings have continued the downward trend. 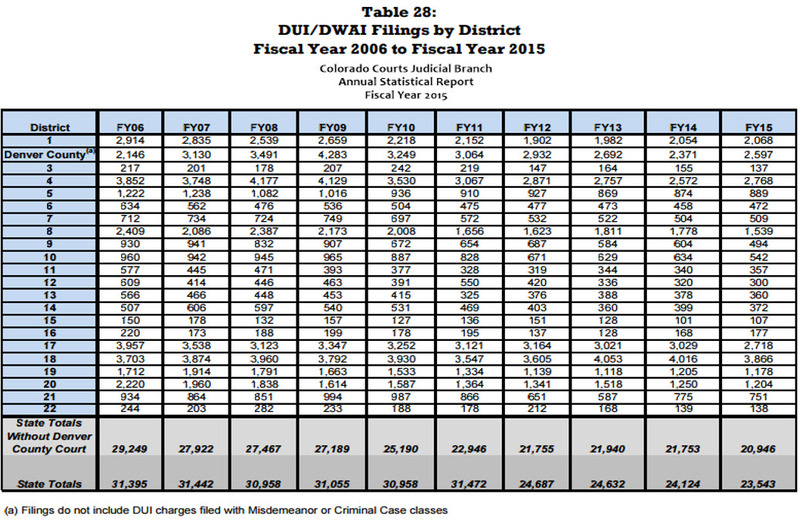 Looking at long-term trends (Figure 6, labeled Table 28), we can see that Colorado DUI and DWAI court filings have been on a downward trend since 2006. Denver County did have a spike in increased DUI/DWAI filings in the latest fiscal year, 2014-2015, the year retail sales of marijuana reached new highs. (Pun intended.) But it should also be noted that Colorado had new breathalyzers handed out in 2013 (if things went as scheduled as reported in the CDOT Annual Report 2012, Office of Transportation Safety and Traffic Engineering Branch), and 2014 was the year state-wide marijuana blood testing underwent hefty changes with the Colorado State Police. A pilot saliva testing program started in 2015. In the last few years, most notably in 2014 with the legalizing of legal retail sales of marijuana, there has been increased attention by law enforcement to “driving while high.” A million dollars was spent by the Colorado Department of Transportation for the “Drive High, Get a DUI” awareness program. Without a doubt, police were acutely looking for signs of marijuana. The nation is watching Colorado, and the police are out to find the driving while drugged drivers. 2014 was the first year the Colorado State Police put out a report announcing year-long data collected on marijuana-related DUI violations, which we will report on next. The keyword in the report? “Suspected.” The report is based on suspected use, including “smelling marijuana.” MADD (Mothers Against Drunk Driving) has changed their vision statement to include “help fight drugged driving,” law enforcement officers are attending special training sessions to deal with drugged drivers, and conferences are being held to discuss strategies for documenting the data and dealing with the testing nuances of legalized marijuana. Slides from the 2015 Driving High Conference in Chicago that catered to traffic and law professionals from Colorado, Washington and Oregon, pointed out state patrol schedules changed for more frequent visibility and high visibility efforts were enhanced. Yet, with all this increased attention on drugged drivers and all the cannabis that’s gallivanting around Colorado, Colorado roads remain safe. The most potentially dangerous years are now written into history. Data specialists can get their high crunching numbers while creating benchmarks and warnings for policy-makers and activists. The field for marijuana testing and exploration is wide open, and lawyers will be watching every court decision like a hawk. Do you want to see marijuana legalized nationwide? Don’t drive high. Prohibitionists are looking for ammunition. Enjoy your cannabis, don’t be the bullet.